Chanel jackets traditionally have the lining and the outer fabric quilted together, this is obviously done before any construction so space has to be left for seams etc. I tacked the lining to each piece by hand, I did toy with the idea of using spray baste, but in the end I decided to just quickly hand baste it as I was concerned about the edges getting tacky. I used an old-fashioned ruler to work out my quilting lines as that was just a nice width. This is where I found perhaps my grainlines were not as straight as they could have been! I decided it was probably the underneath piece that was slightly off, with this fabric I don’t think it matters but it would be worth remembering for a more distinctive pattern. 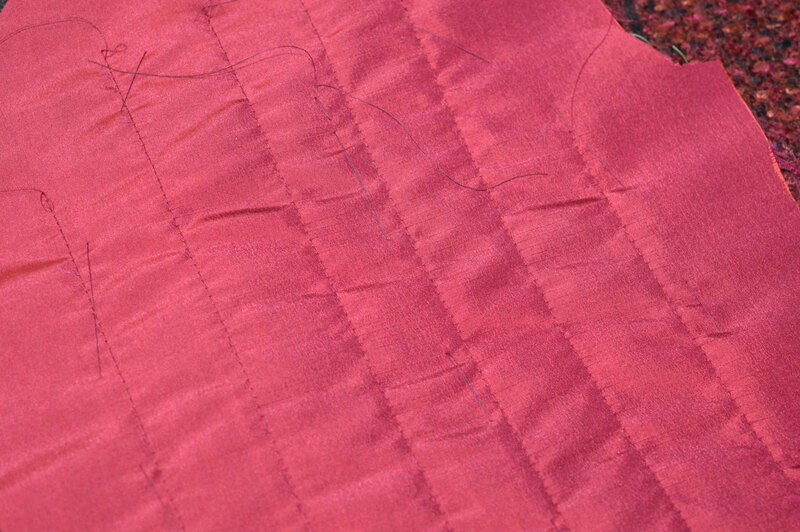 The quilting lines were all stopped about 1.5-2″ above the hem or the seam, it wasn’t always easy to remember to stop!! This evening I need to thread all the loose threads to the inside and loosely tie them off. Once the pieces were quilted we had to baste the jacket together for the final fitting. I must admit I couldn’t remember if it was to be hand or machine basted, I hand basted the seams as with the loose weave I thought undoing a machine baste would be an awful job! I cut out a size 12 but left a 1″ seam down the sides, so I’ve stitched the side with 1″ at the top but graduating out a bit to allow for my ample hips! It looks pretty good on Florence, my muse, I’ll add a sleeve this evening then hopefully I’ll be all ready for day two tomorrow. This entry was posted in Dressmaking, Serendipity and tagged Chanel Jacket, Dressmaking, Yorkshire School of Sewing. Bookmark the permalink. it’s certainly looking very promising so far! Margaret, it is looking great so far!! I’ll be interested to see if she does anything with your sleeves, that seems to be the thing with these jackets whenever I see a Susan Kahlje class post. I’m thinking about a Chanel jacket out one of my tweedier wool pieces. I love this so far. I can’t wait to see how it turns out! Funny thing is, you can’t really see any quilting. It’s all about adding structure, isn’t it? I think you were wise to hand- rather than spray-baste, as you don’t really lose the sticky till the piece is washed, and this isn’t a garment you’ll be slinging in the washing machine, is it? This fabric is lovely. I can’t wait to see it finished. 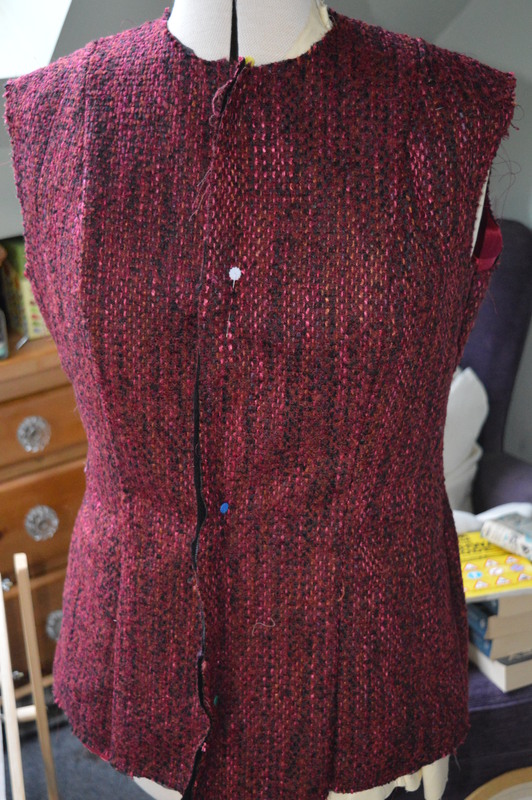 Hand sewing is not my favourite and this is lots of work – but it is definitely worth it. What gorgeous fabric, this is going to be a beautiful jacket. Great work! Most of this went over my head, but I can tell it is going to be fabulous!